Hello summer! It’s so very nice see you. Yes, even with your ninety degree scorchers that are making me water our hydrangeas bushes three times daily, I am quite thankful you’re here. I’ve been thinking about the seasons again since we’ve just embarked on a new one, because with dawn and newness of each, a different tone settles in and washes over everything, making the way we spend our days stand apart and shine differently from the season before it. This change in attitude strings the hours together just so, making bedtime look different, mealtime reflective of what’s growing outdoors, and mornings either time either one to make more coffee or get that walk in before the sidewalk gets too hot. Everything takes on a new light and gives us the beautiful and reflective opportunity to tag along so we may look at our lives a bit differently than we did before when things were either cooler or warmer, and altogether much different. This change grants us the go-ahead to act accordingly in our own homes and lives, whether that means eating ice cream cones for supper as the sun goes down around nine or taking two naps while the quiet snow covers the frozen ground. Seasons point us in the direction of a new pace, and summer’s just might be my favorite. There’s a vibrancy and go-get em’ temperament that tends to get stirred up in the springtime. New grass, new flowers, spring cleaning, and new arrangements at home after the Christmas decorations have been taken down. These all signal growth and change. Then in autumn there’s a whole other type of excitement in the air as everyone heads back to school and starts following new routines as life requires things to fall into order again. I love how this attitude gets mixed in with the coziness of warm soups and football and crunchy leaves during these orangy-amber colored months. And you have the bleak and blustery winter with its unapologetic “were gonna hunker-down under all the blankets and watch Elf three times in wool socks and flannel pants today” attitude. Slowness and warmth follow around this season of white and wood, allowing you to savor family and friends in a different way, but always fireside. Alas, there’s summer, the hottest months of the year that smell like watermelon juice and citronella oil and sunscreen. Finally, it’s here with its whimsical “no rules” nature that gives us permission to really let loose and disregard daily rhythms, simply because you can say, “well, it IS summer after all.” I love how every time summer rolls in it brings with it a IDGAD (I Don’t Give A Darn…to keep things G rated around here) attitude. You can stay up late and eat whatever and wear swimsuits in lieu of clothing. It’s the free-for-all of the four seasons and it might just be the most fun. Yesterday while Alfie and Theodore took their afternoon naps, Stella and I had fun in the kitchen doing summery things to celebrate the first day of our no-rules season. I pressed my cold brew and added half and half with a drop of lavender, and together we made a few batches of pickles, our favorite summertime snack. Like this garden dressing, you can almost always find a jar or two of something sitting in vinegar on a ledge in our fridge during the warmer months. Also like my homemade ranch, the base for all my pickles is the same but the add-ins is where I get to really get creative. 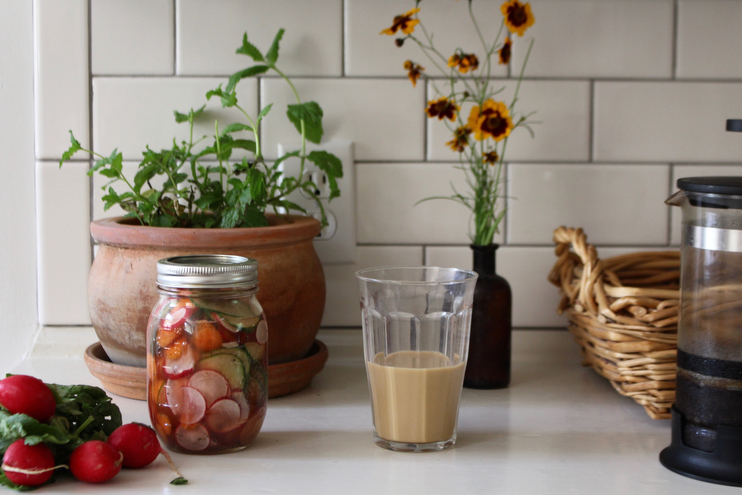 Below are my simple recipes for pickles and cold-brew coffee. Happy summer you guys. Enjoy this new pace this seasons has give us. roughly 4 pounds of vegetables – I rarely just use cucumbers. 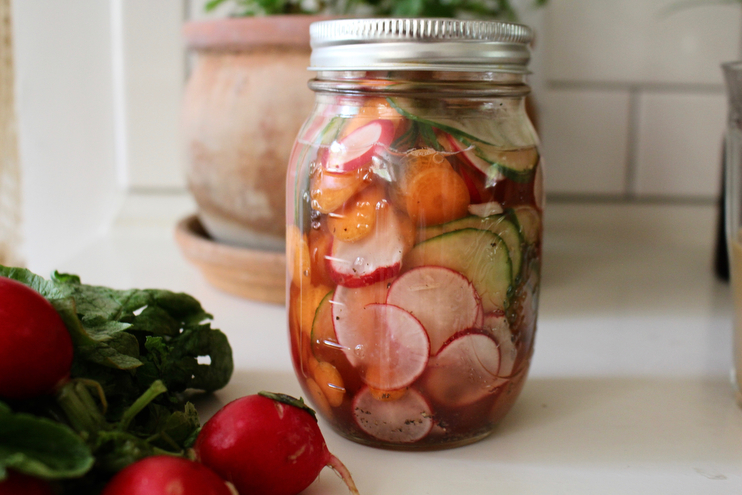 Lately we’ve been pickling up radishes, carrots, wax beans and squash. I’ll slice them fine or thick depending on what we are using them for. You can do this however you want, that’s the blessing of making your own! Keep in mind, one pound is about 3-4 cups depending on your veggie. 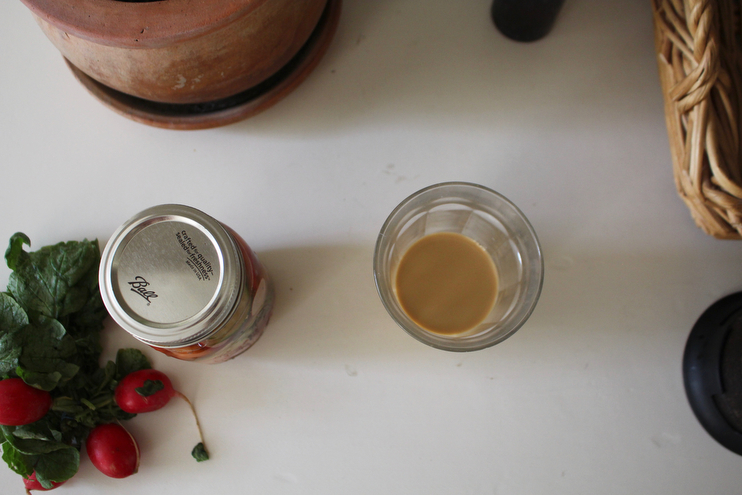 2 3/4 cups of vinegar – Red wine is a favorite in the summer, but rice wine is nice if you’re adding some peppers, too. To prepare, mix the salt, water and vinegar together in a pot over low heat until the salt is well dissolved. Bring this mixture to a boil and pour over your vegetables in a glass weck or mason jar. Your jar should be at room temperature and your vegetables should be packed in rather tightly. Next you can add in some fun ingredients like herbs, spices and garlic to give your pickles a different flavor profile. Dill and red pepper flakes is a really yummy combo. Make sure once you’ve filled your jars with everything you give it a good shake. Kids are great helps for this step! Also make sure to leave about 1/2 in head space only if you are going to seal and preserve your pickles. Sometimes, like yesterday, we will just put this mixture in the fridge and eat our pickles after a day or so of them soaking in the pickling liquid, but you can absolutely seal them to make them last for a very long time. My grandma always said preserved food lasts roughly one year when canned properly, so make sure to date the jar before storing. The easiest method I have found is to place your sealed jars in a big stockpot of boiling water with about an inch or two of water covering the lids. Boil for ten to fifteen minutes and use metal tongs to remove your jar. Let this cool on the counter and come to room temp before storing in a cold place. Once you hear the ol’ “POP!” of the seals you’ll know you’re good to go and your seal took.